189 Colors of Czech Glass MiniDuo Beads are now available! We just added even more colors of Czech Glass Miniduo Beads and have the largest selection of Miniduo Beads available online. We now have 189 colors of Czech Glass Mini Superduo Beads! The color options are amazing on these mini superduo beads. 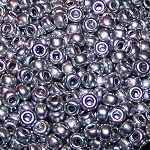 Miniduo Beads are similar to Superduo Beads but 20% smaller. Czech Glass MiniDuo Beads will allow for even more intricate bead work. We hope you enjoy the beautiful new colors and have fun creating with them. New Miyuki Czech Unions Size 6 Seed Beads Just Added! Miyuki Size 6 Unions are Miyuki Japanese Glass Seed Beads that are coated with beautiful Czech Glass finishes. Union Seed Beads are extremely uniform in size, shape, and color. Miyuki Unions are Size 6 which is also known as #6 seed beads or 6/0 seed beads. This size measurement term for seed beads basically means it takes about 6 of these seed beads side to side to equal an inch. Miyuki Size 6 Unions will work great with all of our Czech Glass Beads. You can use them in all of your favorite jewelry patterns. There are approximately 95 seed beads in a 7.5 gram package. New Miyuki Czech Unions Size 8 Seed Beads Just Added! Miyuki Size 8 Unions are Miyuki Japanese Glass Seed Beads that are coated with beautiful Czech Glass finishes. Union Seed Beads are extremely uniform in size, shape, and color. Miyuki Unions are Size 8 which is also known as #8 seed beads or 8/0 seed beads. This size measurement term for seed beads basically means it takes about 8 of these seed beads side to side to equal an inch. Miyuki Size 8 Unions will work great with all of our Czech Glass Beads. You can use them in all of your favorite jewelry patterns. There are approximately 325 seed beads in a 7.5 gram package. Calcite Semiprecious Gemstone Beads Now Available! We are happy to now offer 7 sizes of Calcite Semiprecious Gemstone Beads. We have Calcite in 4mm, 6mm, 8mm, and 10mm Rounds. We also have Calcite in 13x18mm Puff Ovals, 12x16mm Puff Rectangles, and Irregular Chips. Calcite is a beautiful honey yellow colored stone. Our Calcite is very high quality with a nice polish and good shape. New Miyuki Czech Unions Size 11 Seed Beads Just Added! Miyuki Size 11 Unions are Miyuki Japanese Glass Seed Beads that are coated with beautiful Czech Glass finishes. Union Seed Beads are extremely uniform in size, shape, and color. Miyuki Unions are Size 11 which is also known as #11 seed beads or 11/0 seed beads. This size measurement term for seed beads basically means it takes about 11 of these seed beads side to side to equal an inch. Miyuki Size 11 Unions will work great with all of our Czech Glass Beads. You can use them in all of your favorite jewelry patterns. There are approximately 800 seed beads in a 7.5 gram package.